Pinterest is an ever changing platform that always seems to keep us guessing. But here are a few lessons I learned as I saw 40% of my traffic come from the Pinterest search engine! 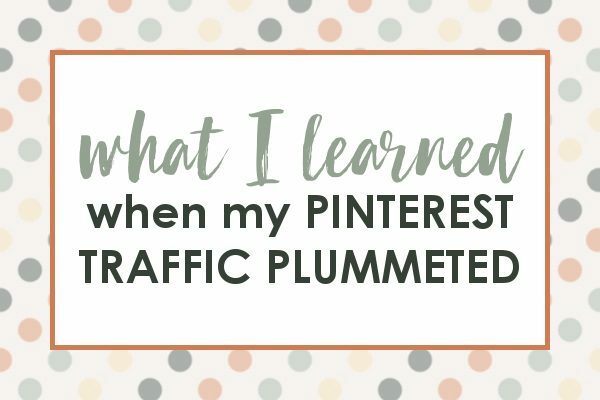 If you’ve been on Pinterest for a while, at one time or another you’ve probably experienced a huge “drop” in the traffic they are sending your way. This past year many in the blogging world felt this keenly as they saw up to 70% less traffic, myself included! It was a huge shock and thankfully my SEO efforts picked up the slack so my page views remained about the same. This event also gave me the opportunity to reflect and learn from the experience. This list isn’t about how to make the best Pinterest images, or how to find the best group boards. No, these lessons are much more important than that! Hopefully after reading this list you’ll have a new appreciation for your Pinterest efforts going into the next year! Pinterest is fickle. Seriously, you never know what you’re going to get when you log into your account, or try to pin from the mobile app. You might see the same setup you’ve been using for the last 3 months, or it might be completely different. Likewise, you cannot count on the algorithm to stay the same like you can for the most part with SEO traffic. Instead, Pinterest is an ever moving target when it comes to what works. Which leads me to number two. What works for someone else (or a bunch of someone elses) may not actually work for you and your niche. Every niche is different and it may take you a while to find what works. But it’s worth the effort to find out what DOES work for you. Even if it might change next week, Pinterest is worth working with since it drive so much traffic (even during the down times). In fact, I saw a huge jump in traffic from just a few simple changes in the way I was creating my Pinterest images! Currently I am using a manual pinning technique that has increased my Pinterest traffic by 46% on one site and 90% on another! While manual pinning sounds like a huge time drain, I’m able to manually pin daily in less than 15 minutes TOTAL for all 3 of my sites. Totally worth it! This is the system I have been using, it’s a really affordable resource, and I highly recommend anyone who wants to increase their Pinterest traffic give this system a try! People ARE going to steal your best images and redirect them to their own sites. This happens so often it’s ridiculous! I had several pins suddenly stop sending traffic altogether and when I looked into it, I found that they had been stolen and completely redirected to a non-relevant (and not mine) website! So while some traffic drops from Pinterest may be due to algorithm changes and whatnot, sometimes you’re just facing a pin thief! This video is a bit long, but it has all the info you need for finding out if this is happening to you, and how to deal with it if it is! Clicking will not stop the video. You shouldn’t have all your eggs in one basket. When it comes to bringing in traffic for your site, you really do need to make sure you are diversifying your efforts. When I first started A Modern Homestead, over 98% of my traffic was coming from Pinterest. Frankly, that scared the you-know-what out of me! I know that I never like to have all my money coming in from one source (though sometimes it happens), so I knew that the same idea needed to apply to my traffic. So what can we do?? The first thing to do is take a deep breath. I know it can be terrifying to log into your account and see drastically less page views on your blog that day compared to the day before. In reality, blogging is a year to year game. You really need to be comparing this January as a whole to last January as a whole. Only then are you really comparing apples to apples. So taking that into account, check out your year to year performance (if you have that data available) and see how you’re really doing. Here’s a good article on how to compare year to year in Google Analytics if you’ve never done it before! 1. Start working on your SEO traffic. With just a few hours of effort I was able to increase my search engine traffic by over 2,000% last year. 2. Get more involved in Facebook with your page and especially with groups. You can now create a group page and link it to your business Facebook page so your followers can join! Here’s a free group that talks about the current best practices for getting Facebook traffic. You have to join the email list to get into the Facebook group, but you can unsubscribe right away! 3. Branch out to other social media platforms like StumbleUpon, Reddit, and even Linkdin. This is something I really need to work on, but my friend Anna has done amazing things with these platforms! Bottom line: Pinterest is basically a moody teenager. You never know what you’re going to get and most of the time you just have to roll with it. Don’t look for your blog worth from the way Pinterest treats you and start diversifying your traffic sources now to help pad any Pinterest changes that may be coming down the line! Want to turn your blog into a business and real income source for your family? I created this just for you! Previous Post: « How to Start a Blog! Thank you so much for this article. My Pinterest traffic was building steadily and all of the sudden it dropped to almost zero. I was so confused and thought I was doing something wrong. I’m going to take your advice and diversify my marketing efforts. Great article! I am still getting about the same amount of traffic from Pinterest, but I noticed that my Pinterest monthly viewers have been decreasing steadily. I’m having trouble finding out if this is because of an algorithm change or not. Thanks Megan! Pinterest can definitely be frustrating, but it’s worth the effort! I will say that monthly viewers matters far less than clicks. I'm Victoria, former teacher turned full time blogger and homesteader! Let me help you create a blog that will be fun and profitable with minimum effort!